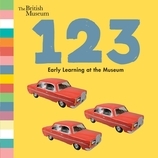 Using amazing objects from the British Museum, this series of captivating board books encourages children to engage with early learning concepts. Inquisitive toddlers will enjoy learning their ABCs, 123s, opposites, and colors with gorgeous photographic images on every page. As beautiful as the objects inside them, these board books make wonderful gifts. 22 / 7 7/8" x 7 7/8"
The British Museum is “a museum of the world, for the world.” It is the U.K.’s leading visitor attraction and the second most visited museum in the world.